Hand stretches can help relieve some of the stiffness or pain related to steering all day. When you stop to refuel or take a break, rotate your wrist left and right or in a circle. Stretch your wrist by placing the fingertips of one hand on top of the steering wheel. Gently press your weight into your hand and hold the stretch for 30 seconds. Repeat with the other hand. Strengthen your abs while you’re on the road. Squeeze your abdominal muscles and hold it for the entire length of your favorite song, podcast or news report. If you are unable to squeeze your abdominal muscles for that long, then aim to squeeze them for at least one to two minutes. Repeat at every red light or for every favorite song that comes on the radio. Plank exercises help strengthen your back, arm and leg muscles, as well as your core. Find a spot where there is room to stretch out, start off the exercise by getting on your hands and knees. Place your forearms and hands onto the ground with your palms facing downward. Kick back your legs so that you are placing your weight on your toes. Your entire body should maintain a straight line. Hold this position for 30 seconds. Help relieve the stress and tension from your shoulder area with shoulder shrugs. Try this exercise while stopped at a red light, waiting on a shipper or taking a break. Lift your shoulders up to your ears as if you’re saying “I don’t know.” Hold the position for a few seconds then release. Perform 10 to 15 reps throughout the day whenever you are feeling tensed or stressed. Strengthen your arms and chest with some push-ups. You can do regular push-ups keeping your legs extended behind you and your arms slightly wider than shoulder-width apart. Mix things up with a diamond push-up where your hands are placed in a diamond shape directly under your chest. Or, increase the degree of difficulty by propping your feet up on the bumper of your truck. Photo courtesy of Men’s Health. 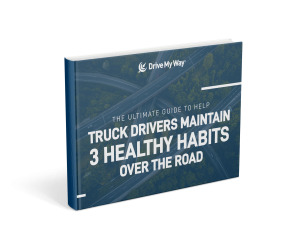 Download the complete guide for tips to easily maintain healthy habits over the road. Join over 17,000 drivers across the country who stay up-to-date in the industry by receiving our driver newsletter. 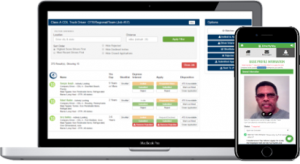 Drive My Way matches drivers with jobs based on their qualifications and lifestyle preferences. Join over 17,000 drivers who receive our updates.